LAST week the city revealed the highly-anticipated relay route for the soon-to-be-visiting Olympic flame, which will criss-cross Edmonton on January 13th. The 82-year-old flame will travel 14 kilometres over a two-hour relay, and will be carried by 50 torchbearers, starting at Hawrelak Park at 5PM. From there the torch will reach the Butterdome near the University of Alberta (5:14PM), and then it'll hit Whyte Avenue (5:28PM) before trekking across the Walterdale Bridge to the Alberta Legislature (6PM). It will then be carried down Jasper Avenue and to its destination Sir Winston Churchill Square, where Edmonton-born Olympic speed skater Doreen Ryan (1960 & 1964 Winter Olympics) will use it to light up the community cauldron at about 7PM. The city will then kickoff a wrap-up celebration on Churchill Square, featuring live performances from Aboriginal women's contemporary a capella trio Asani, ukulele cover band The Be Arthurs, and rapper & Edmonton's current poet laureate Cadence Weapon. The route will also include numerous other activities and entertainment, such as a street hockey game at the U of A area, sports-themed film showcases at Whyte Avenue's "Storefront Cinema," hoop dancer Dallas Arcand at End of Steel Park, hip-hop group Red Power Squad at Abbey Glen, and an autograph session with Olympic and Paralympic athletes at City Hall (4-5PM), as well as "roving entertainers." For a complete list visit the city of Edmonton's official website. The torch will then commute to various other surrounding communities before reaching Red Deer. It's final destination, of course, will be Vancouver, which will host the 2010 Winter Olympics from February 12-28th. Relay organizers are hoping that some 20,000 Edmontonians will align the route on the Wednesday night. They urge those who do come out to wear red as part of the city's "Painting the Town Red" campaign, and ask local businesses to do the same. Vancouver's torch relay is the longest through a single country in Olympic history, as the torch will see over 12,000 folks carry it over 45,000 kilometres of the host country. See you there? 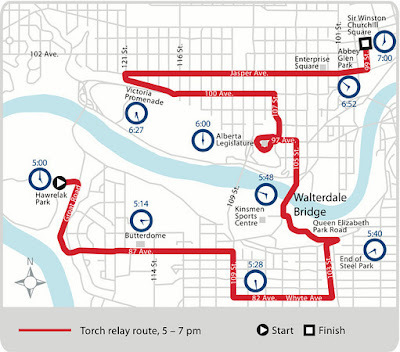 The complete map of the Edmonton Olympic Torch Relay (Jan. 13) is provided below. Labels: Asani Butterdome Cadence Weapon Dallas Arcand Edmonton's Olympic Torch Relay Hawrelak Park Jasper Ave. Painting the Town Red Sir Winston Churchill Square U of A Whyte Ave. Thanks for putting together this great summary. I'm looking forward to seeing the torch live in person! You're very welcome...I'm looking forward to seeing the torch as well. Can't wait!